Beaver Creek opened for the season on Friday, and more snow is in the forecast for this week (Beaver Creek photo). Vail and Beaver Creek opened for the 2016-17 ski season on Friday, just in time to capture more than a foot of fresh snow forecast to fall Saturday night through Tuesday. Beaver Creek and Vail both saw new snow earlier in the week, with Beaver Creek topping out at 8 inches new on Wednesday after a winter storm got things started late last week. Despite seeing its World Cup races cancelled due to a warm, dry fall, Beaver Creek has now received nearly 2 feet of new snow in the last week, with more on the way. “The weather has shifted in our favor this last week, and our snowmaking and mountain operations teams have been taking advantage of every moment of cold temperatures, as well as the almost two feet of snowfall, to prepare a great skiing and snowboarding experience for our guests,” said Doug Lovell, chief operating officer Beaver Creek Resort. Beaver Creek is currently limited to skiing on just two runs — Haymeadow and Gold Dust — while Vail is serving up turns on Born Free. Both mountains are looking to offer more runs with the fresh snow and colder temperatures expected this coming week. 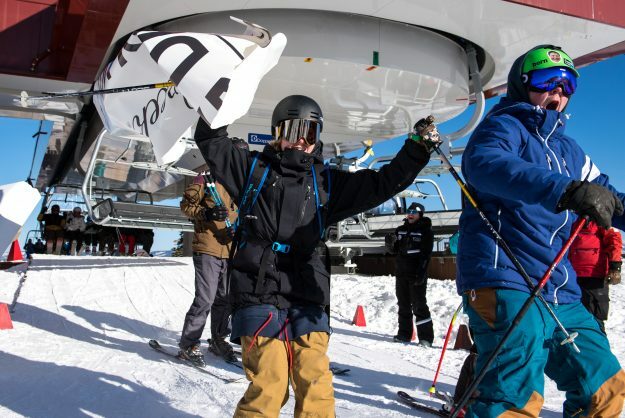 While the annual Birds of Prey World Cup races have been cancelled (and picked up by Val d’Isere, France), many of the festivities scheduled to bolster the races will still go on this coming weekend. “Snow has blanketed our valley and we are looking forward to a great winter season,” said Vail Valley Foundation spokesman Tom Boyd. “To celebrate, we will be hosting the second annual EverBank America’s Winter Opening in Beaver Creek Dec. 1-3 with concerts, kettle curling, fireworks, and a lot more. Beaver Creek, Colo., Nov. 24, 2016 — Winter has arrived, and Beaver Creek will be celebrating its arrival at the second-annual EverBank America’s Winter Opening on December 1-3. The event features a soaring lineup starting Thursday, Dec. 1 and continuing through the weekend with concerts, kettle curling, sponsor expos, on-site giveaways, restaurant deals, fireworks, and the all-new Beers of Prey beer tasting event at the Vilar Performing Arts Center. Tickets are on sale now for a series of events, including the ‘Beers of Prey’ winter seasonal beer tastings, performances from Strange Americans, Bonfire dub and friends, and a showing of The Fourth Phase, the new movie from Red Bull Media House (see below for full schedule of events). Visit AmericasWinterOpening.com to buy tickets and learn more. The ‘Beers of Prey’ craft beer tasting session will take place at the Vilar Performing Arts Center Friday, Dec. 1. The event will bring ten craft breweries to the VPAC for a sampling of their finest products and featuring their winter seasonals. The event will also offer special passes to three special-release tasting sessions in the VPAC’s May Gallery. Patrons can pair the tasting with the Bonfire dub concert (which also takes place at the VPAC on Friday night), or purchase tickets solely for the tasting. Friday night tickets are available at AmericasWinterOpening.com for $35, and the special tasting sessions are $10 each. Combine the concert and the tasting for $40. As part of the EverBank America’s Winter Opening, Birds of Prey Way festivities are also set to take place in Beaver Creek village Friday and Saturday. The Pumphouse Bar will open at 3 p.m. on Friday and 12 p.m. on Saturday with specials on Lagunitas beer, Korbel California Champaign, and other winter libations. The Winter Wondergrass All-Stars play live music Friday afternoon in the Village, and Town Cavalry, followed by the Williams Brothers Band, play Saturday afternoon in the Village, alongside the popular kettle curling tournament, demos and sponsor booths, prizes and giveaways. The unique “raptor experience” will also be on hand. This perennial favorite is provided by the Raptor Education Foundation, which brings real birds of prey to Beaver Creek each year. This year the Raptor Education Foundation is expecting to bring its golden eagle, screech owl, and other birds of prey to Beaver Creek Village Friday from 3 – 6 p.m., Saturday from noon-to-6 p.m., and Sunday from 9 a.m.-to noon. Sponsor expos will bring games, prizes and giveaways to the Village on Friday and Saturday, with activations from Cirque Mountain Apparel, EverBank, HiDow, BevPaw, Tipsy Elves, Noosa Yoghurt, and more. The EverBank America’s Winter Opening and FIS Audi Birds of Prey are brought to you by the Vail Valley Foundation, Beaver Creek Resort Company, Vail Resorts, Town of Avon, U.S. Forest Service, EverBank, Audi, USSA, FIS, Longines, Putnam Investments, the Vail Daily, The Steadman Clinic, Korbel California Champagne, GoPro, and NexGen Hyperbaric. For more information about the EverBank America’s Winter Opening visit AmericasWinterOpening.com or call the Vail Valley Foundation at (970) 777-2015.